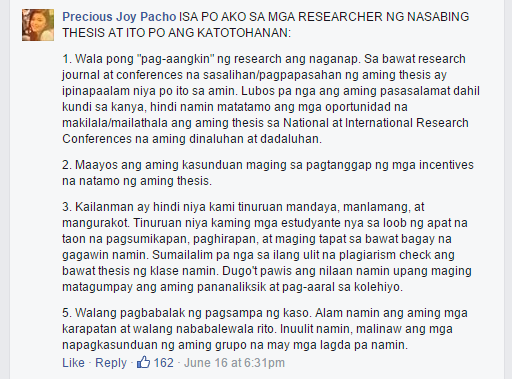 Did PUP director commit plagiarism, steal thesis work? Home / news / viral / Did PUP director commit plagiarism, steal thesis work? A director of the Polytechnic University of the Philippines (PUP) has been accused of committing plagiarism and stealing students' thesis work. In a lengthy Facebook post dated June 16, the community page "Wag kang Kukorap - PUP" identified the school official as Racidon Bernarte, chairperson of the Department of Communication Research and concurrent director of the Research and and Extension Management Department at PUP. 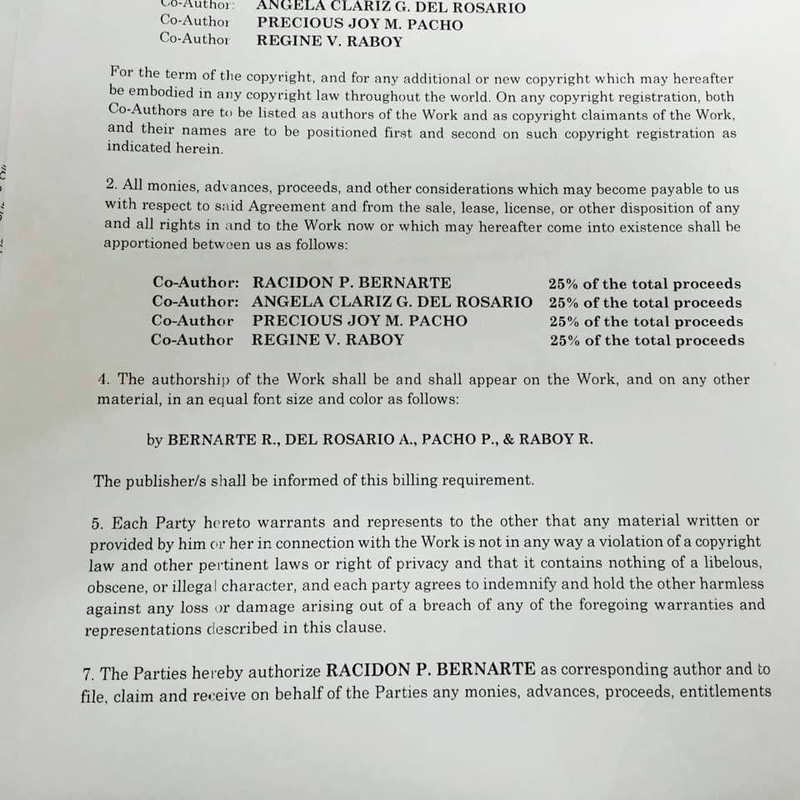 The post alleged that Bernarte plagiarized and stole the thesis work of Angela Clariz Del Rosario, Precious Joy Pacho, and Regine Raboy — they already graduated last April. 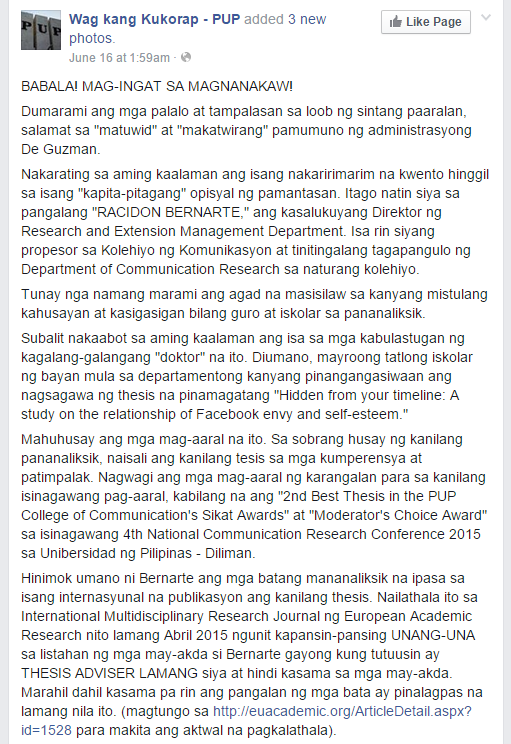 Titled "Hidden from your Timeline: Facebook Envy and Self-Esteem of the Filipino Youth," the research paper won 2nd Best Thesis in the PUP College of Communication's Sikat Awards and the Moderator's Choice Award in the 4th National Communication Research Conference 2015 held at the University of the Philippines (UP) Diliman, the post reads. 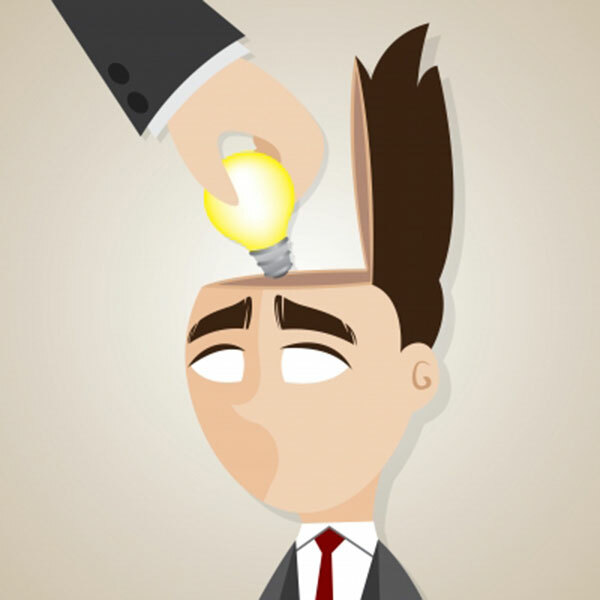 Bernarte apparently encouraged the researchers to submit their article to an international publication. Last April, it was published on the International Multidisciplinary Research Journal of the European Academic Research (EAR), an online forum that features original research papers and reviews. On the article details page, Bernarte is listed first as one of the authors when, in fact, he was only a "thesis adviser," according to the post. Recently, the PUP official submitted the article to the Asia Pacific Journal of Research, "an international monthly journal for open access and printed peer reviewed rapid publication in research," allegedly under his name and without permission from the three authors, the post stated further. A file of the actual document can be downloaded from here. The post said it's a clear case of "plagiarism" and "intellectual dishonesty" which, if committed by a student, bear a penalty of "expulsion." It added that the researchers are planning to file a case against Bernarte for "intellectual property" and "copyright" violations. One of the authors denied this. In her comment, Del Rosario clarified that they agreed to submit the article to the online journals and their adviser paid the processing fee for the research paper. She said their group signed a memorandum of agreement in which the terms and conditions were clearly stated. 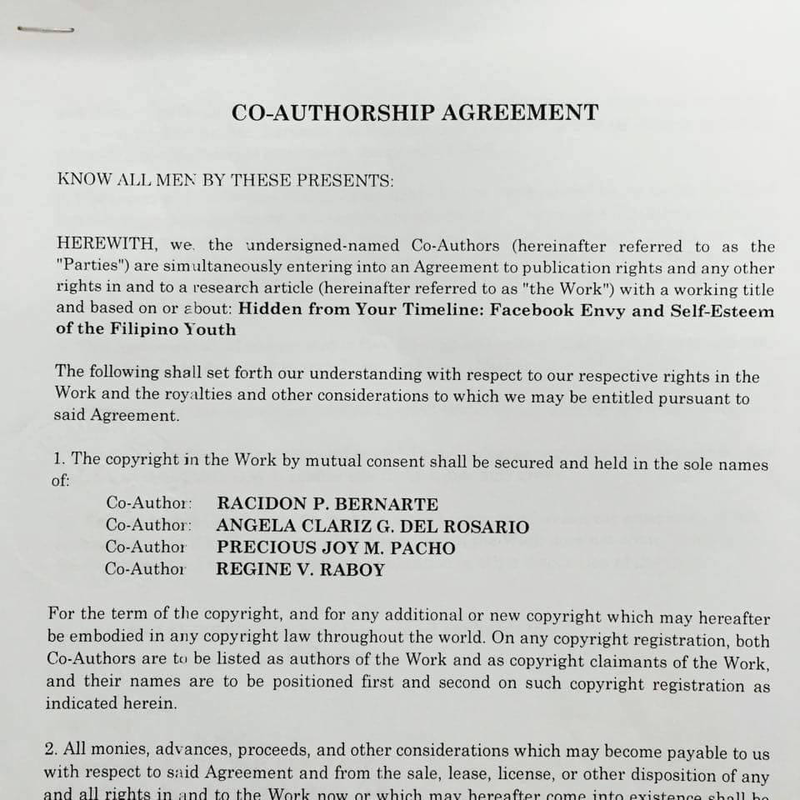 The document Del Rosario was talking about is the written "Co-Authorship Agreement" signed between the group and Bernarte, a copy of which was posted on the Facebook account of Cherry Cabigon-Pebre, chair of PUP's Journalism Department. The document appears to be unnotarized. In a post on June 17, "Wag kang Kukorap - PUP" downplayed Pebre's posting of the "Co-Authorship Agreement" saying that "an agreement between teacher and student does not serve as an excuse for plagiarism. This is not about personal disclaimers or testimonials; it is an issue of academic integrity and the implications of this practice to the rest of the PUP research community." 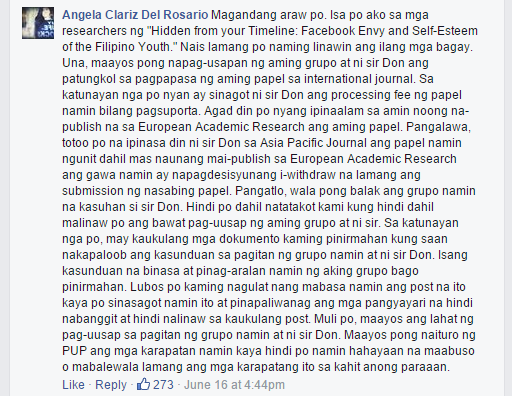 Meanwhile, a co-author of the controversial article posted a comment refuting the allegations against Bernarte. Pacho said the PUP director did not pass off their research paper as his own work and they are not planning to sue him. 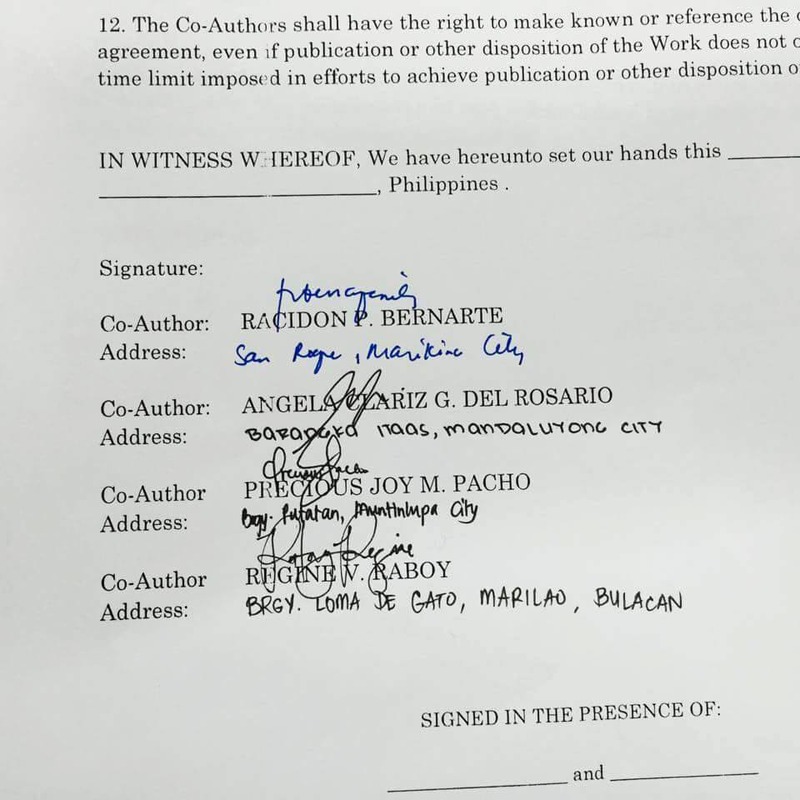 For his part, Bernarte reportedly said the post is malicious and no complaint has been filed against him. "Social media is not the proper venue to answer the accusations. But I know the post is maligning my reputation and my image as a person and as a professional, and there are legal options we are now considering," he told The Filipino Scribe, a popular and multi-awarded investigative news blog.